Oceanteam Shipping ASA has announced that it’s new Lay Vessel, CSV North Ocean 105 which is jointly owned with J Ray McDermott (Norway) AS, has been delivered on time and has immediately commenced a five year time charter. The company’s fleet of CSVs now consists of four partially owned North Ocean Series concept vessels. The five year time charter is with Eastern Marine Services Inc. a 100% subsidiary of McDermott. The vessel has been built and delivered by Metalships in Vigo, Spain. The North Ocean 105 is the fifth vessel to be delivered with this concept developed by Oceanteam Shipping. The North Ocean series is one of the most advanced, able and successful, high-end Construction Support Vessel series to date. The series’ proven quality for advanced deepwater operations under the most demanding and harsh conditions has set a new industry standard. Lay Vessel North Ocean 105 is the second vessel within the McDermott fleet of the North Ocean Series which is jointly owned. CSV North Ocean 102, with its 7,000 tons horizontal lay system, has been working successfully on numerous McDermott projects since August 2010. 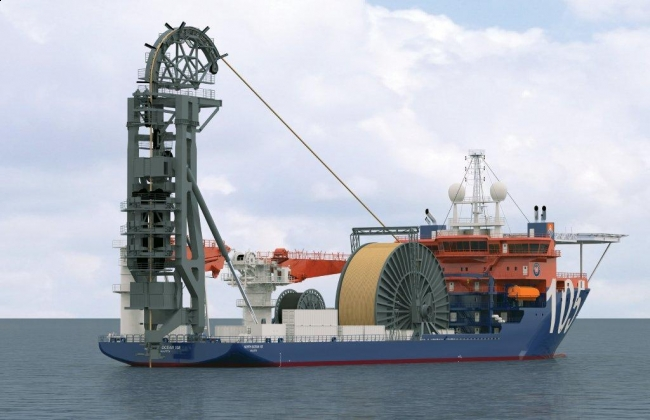 Before delivery to McDermott the vesselwith successfully performed the Statoil Gjoia Power Cable installation and the BritNed interconnector powercable for ABB. 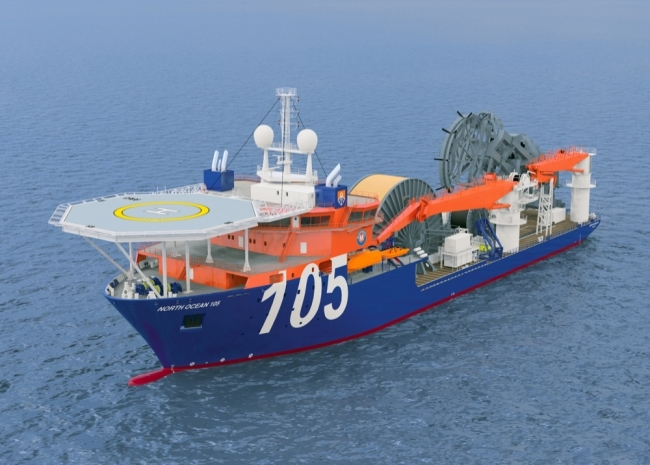 Lay Vessel North Ocean 105 will be mobilized further by McDermott with an advanced 440 tons top tension vertical reel system for rigid and flexible pipelay for depths of up to 3,000 meters. The reel pay load will be a maximum of 2,975 tons in combination with a pipelay tower with 440 tons tensioner. In addition comes two A&R winch systems with capacity of 496 tons and 165 tons respectively. The vessel has a length (LOA) of 145 meters, a beam of 27 meters, and has over 10,000 tons of deadweight with two portside AHC cranes installed of 440 tons and 110 tons for subsea lifts and construction support. Posted on April 23, 2012, in CSV, Europe, MARINE VESSELS, Norway and tagged europe, flexible, Lay Vessel North Ocean 105, Mcdermott, McDermott International, News, Norway, Pipelay, rigid, Statoil, SubSea, Vigo. Bookmark the permalink. Comments Off on Norway: OTS Takes Delivery of CSV North Ocean 105, Begins 5 Year Charter.